The IICRC is committed to providing training materials and standards of performance to cleaning companies and their staff. Both businesses and individuals receive training and certification in a variety of specialties. The certifications and training hours are ongoing and based on changes in current and future cleaning technology as well as changes in upholstery, fabric, carpet and building technology. In order to obtain any certifications, staff and business owners must attend courses that vary from 2 to 5 classroom days. These classes are presented by qualified trainers in controlled settings. All attendees must achieve a total test score of greater than 75% to pass the certification. The Institute of Inspection, Cleaning and Restoration Certification, more commonly known as the IICRC, is a certification and standard-setting non-profit organization for the inspection, cleaning, and restoration industries. Present in more than 25 countries worldwide, the IICRC has a mission to identify and promote an international standard of care that establishes and maintains the health, safety, and welfare of the built environment. The IICRC, originally named the International Institute of Carpet and Upholstery Cleaning (IICUC), was founded in 1972 by Ed York. Since starting in 1972, the IICRC has evolved into global organization with more than 53,000 active certified technicians and more than 6,000 Certified Firms around the world. Currently, the IICRC is headquartered in Vancouver Washington, and has offices in the United Kingdom and Australia. As a professional certification organization, the IICRC does not have members but instead has registered technicians or “registrants.” The IICRC does not operate certification schools but instead approves schools and instructors to teach and administer its certification programs. Cleantrust, a program created by the IICRC, helps consumers identify businesses with high ethical standards and technical proficiency. The cleantrust logo was designed to help promote the IICRC’s mission and certification programs and to help broaden the reach of the institute. Certification is based upon successful completion of a course in which curriculum follows the standards for that category as well as a passing grade on a standardized exam. Once certified, IICRC registrants must earn continuing education credits (CECs) to maintain their certification. BP Carpet Cleaning Instructor – Winnipeg, MB. BP Upholstery Cleaning Instructor – Winnipeg, MB. BP Upholstery Leather Cleaning Instructor – Winnipeg, MB. BP Spot & Stain Removal Cleaning Instructor – Winnipeg, MB. BP Certified Wood Preservation Specialist Instructor – Winnipeg, MB. CGCA Carpet & Upholstery Cleaning Instructor – Winnipeg, MB. Our commitment to our valued customers hinges on the confidence that is instilled in you, knowing that we are one of the very few organizations committed to obtaining and maintaining IICRC certifications. We hold eighteen designations in this organization. CRI has also established a “code of conduct” requiring certified providers to uphold a high standard of accountability, responsibility and customer-oriented service. It also has provisions for carpet manufacturers and equipment and sundries manufacturers, including honoring warranties and providing product usage and cleaning and maintenance information for consumers. The Seal of Approval is celebrating its fifth year anniversary in in 2009 and has grown to more than 186 participating manufacturers with 471 products certified and nearly 700 service providers. 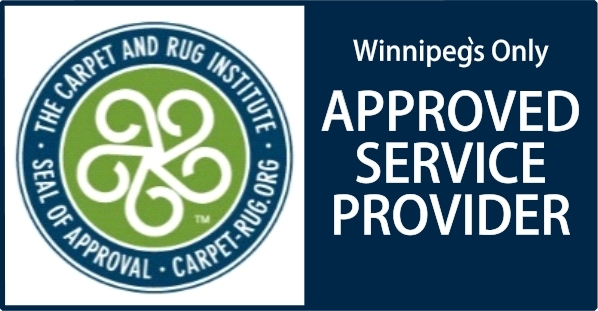 Ultra-Clean is the first and only Winnipeg Carpet Cleaning Company to earn the Seal of Approval Service Provider Certificate and applauds the CRI as they make further changes that raise the bar on Industry Standards. Ultra-Clean is a “member in good standing” of the Canadian Green Cleaners Association. The CGCA seal is your assurance that members adhere to the latest technology, cleaning techniques and business practices in green cleaning and environmental stewardship while providing professional services. 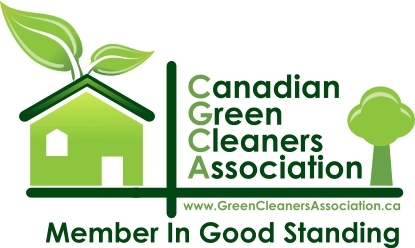 We are proud to be a member of the Canadian Green Cleaners Association. We use carefully selected non-toxic and environmentally friendly products. These cleaning products will not pollute the environment or your indoor air quality. Many ingredients in common cleaning products are potentially harmful to our health. Use of these products may cause acute effects such a respiratory irritation, headache, sneezing, and watery eyes. This is the reason Ultra-Clean is committed to using only non-toxic, environmentally friendly cleaning products and equipment that aid in reducing human health risks in the home or business. Our offerings appeal to both the environmentally responsible person, and health conscious consumers. OUR STAFF ARE CANADIAN GREEN CLEANERS ASSOCIATION CERTIFIED TOO! We have completed intensive specialized training and competency testing in accordance with the CGCA. The CGCA seal is your assurance that Ultra-Clean and its’ employees will adhere to the CGCA Code of Ethics by using the latest technology, cleaning techniques, and business practices in green cleaning and environmental stewardship while providing professional services. The Canadian Green Cleaners Association was founded out of the need to have Canadian Companies properly trained in modern & safe cleaning methods. The CGCA instructors have over thirty years of experience in the carpet & upholstery industry and carry over 50 separate teaching & cleaning certifications. In vision, technology and nature should be in harmony, complimenting each other. This world belongs to a younger generation, and we intend to preserve it clean, green and serene for the future generations. Our vision started out as an idea in 2009, it has now become a reality in 2013. We are true supporters of green clean business, and we hope more and more people will join us in this cause by becoming a certified member of the CGCA. Many forward thinking businesses are realizing the importance of becoming “green” and are joining us in this cause. Our mission is to help our members to be educated in green cleaning products and methods.